12 hours on the ground and our editor Luke Kennedy winds up in intensive care. particular instances he copped floggings. On others, he rode them with style and grace. Then at around 9.30 -10 am, both Col and I came in. Luke stayed out and continued to surf. At around 11am there was a knock on the door. "Are you friends with Luke? He's been hurt." Col and I jumped in the back of the guy's four-wheel drive and gunned it down to Sunset. The ambulance was blocking the southbound lanes of the Kam Highway. Luke was in the back. He'd been caught off guard by a wave surge on the shore break and was tossed forward and impaled on the tail of his board, neck first. He sustained a severe wound in the throat region (just above the collarbone) and lacerations to his nose and cheek. Ross Clarke-Jones stood beside the ambulance and looked almost white. "I didn't even realise it was Luke. It's looks really bad. I tried to stop the bleeding, but when I tried that he couldn't breathe," said Ross. From all reports Luke's board had snapped in two. The ambulance took him to Queens Hospital in Honolulu. Col rode shotgun. Filmer, Damien Wood and I tailed them. The paramedics administered needles to numb his throat, gave him painkillers and inserted a tube that would allow the paramedics to manually breathe for him through an external bag. It was a rattling experience to say the least. At the hospital, we were told Luke would be going into surgery to assess the damage to his windpipe and surrounding organs. Everything else was an uncertainty. There was no guarantee of what the damage was, what the repercussions were, or how long he'd be in hospital. Four or so hours later, we received note that his surgery went well and he was in the intensive care unit. He is currently resting. The length of his stay and the details of his rehabilitation are still unknown, but things appear to be taking an upward trajectory. With any luck he will be back to 100 percent as soon as humanly possible." Note from Col Bernasconi: "I'd like to thank Chris Maguire the American doctor who happened to be on the beach and was amazing in stabilizing Luke and being his lungs on the drive to Queens Hospital in Honolulu. You're a legend mate and we thank you whole heartedly. I'd also like to thank (on behalf of Luke) the paramedics who were there all the way too. What you guys, and Chris, did for Luke in the back of that van was outstanding. Thank you. 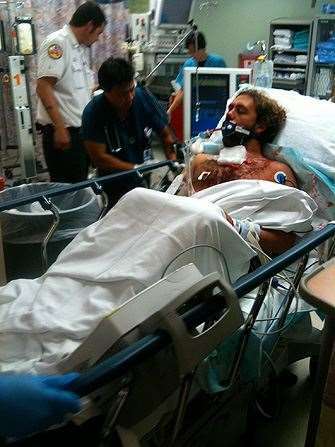 I also want to thank Ross Clark Jones and the other two surfers who helped Luke on the beach, it was a shocking accident and I thank you for your courage. Further more and without any kind of order I want to thank the staff at Queens Hospital for being so understanding and helpful in looking after Luke. Sorry about our slack Aussie slang. Lastly I want to thank all those Hawaiians on the road on the way to the hospital. Every car, truck and van pulled over and more often than not stopped to let our ambulance pass without pause. If we're searching for Aloha in Hawaii, then we've found it. Mahalo to you all."